The Confederated Tribes of the Colville Reservation target wolves in an expanded hunting season in an off-reservation area where they retain hunting rights. An off-reservation wolf hunt has been approved by the Confederated Tribes of the Colville Reservation. The tribes approved the hunting season in special session Thursday, in the so-called north half — a sweeping reach of country north of the tribe’s reservation boundary to the Canadian border, between the Okanogan and Columbia rivers. Colville Tribal Fish and Wildlife Director, Randy Friedlander noted the tribes opened a wolf hunting season on the south half in 2012, and last year saw the first wolf killed by a hunter -— who was actually out for deer, rattling antlers together to attract them. “A tribal member was rattling for whitetail deer and called in a wolf instead. That’s when he decided to shoot it,” Friedlander said. Friedlander added he doubts many tribal members are out actively hunting wolves, but creating regulated seasons ensures they have the opportunity to legally shoot a wolf if encountered at certain times of the year. “Whenever there is an opportunity available for tribal members to practice their traditions through hunting or fishing it is important to make sure that opportunity is made available,” Friedlander said. The expansion of the tribe’s wolf hunting area was welcome news to some, and brought despair to others. The state Department of Fish and Wildlife has already killed two wolves in the Smackout Pack and may kill more, to protect ranchers’ cattle. Hank Seipp, director of the Western Wildlife Coalition in Spokane, said he was concerned that increasing the hunt will lead to more poaching and trapping in northeastern Washington of the wolves, prized for their black coats. “To me, it’s a travesty, it puts more pressure on them from all sides,” Seipp said of the wolves, listed as a state endangered species. “It couldn’t hurt, as far as I’m concerned, it’s a good move” said Don Dashiell, county commissioner in Stevens County, where ranchers are bearing the biggest burden of the state’s wolf recovery plan. Most of the state’s 20 packs are in northeastern Washington, home to many ranching operations. Most packs don’t kill livestock. But ranchers who now find themselves again in wolf country are being forced by the return of the wolf to change their practices, shouldering extra work and expense and a worry for the welfare of their animals. The Washington Department of Fish and Wildlife (WDFW) already has killed two wolves so far this summer in the Smackout Pack, east of the tribe’s reservation, and may kill more, to protect ranchers’ cattle. The Colville reservation is home to at least three known wolf packs, and the head of a wolf — with salmon depicted in the pupils of its eyes — adorns the tribal government’s home page on its website. The north half of the tribes’ reservation created by executive order in 1872 was taken away by an act of Congress in 1892, following discovery of gold in the area. The cession of the north half reduced the reservation to 1.4 million acres — about half of its original size, to the boundaries of the reservation today. However, tribal negotiators permanently retained tribal fishing and hunting rights in the north half. All of the north half and lands beyond into the Canadian border were in the tribes’ aboriginal territory pre-1900. In voting for the measure, Michael Marchand, chairman of the tribal business council, noted that the wolf is a sacred animal to the Colville tribes, and that elders used to keep wolves as pets. “There’s pictures of them with wolves in front of their tepees. So that’s a pretty good guard dog to have,” he said, according to minutes of the meeting. The wolf-hunting season in the north and south half is open only to tribal members, and runs from Aug. 1 until Feb. 28. The hunting seasons allow up to a total of three wolves to be killed in each half. No tribal member may take more than one wolf, according to the regulation. The tribe comanages wolves in the north half with the WDFW. With hunting seasons on in both the north and south halves, the tribes potentially have a target on a total of seven known Washington packs: Wedge, Profanity Peak, Sherman, Beaver Creek, Strawberry, Nc’icn and Whitestone. The state killed seven members of the Profanity Peak pack last year, including a pup, to defend ranchers’ cattle. The state intended to kill them all, but a female and three pups escaped. The female is collared, and is believed to be establishing a new territory this year. The fate of the pups is unknown. Hunted, poisoned and trapped to local extinction by the 1930s, wolves are making a comeback in Washington. The first pack was documented by the department in 2008, and wolf populations have been growing at about 30 percent per year. 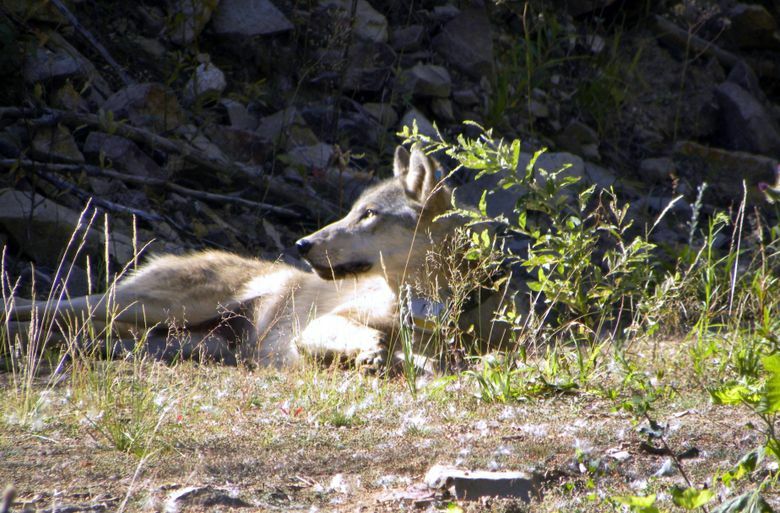 The state documented the first wolf in modern times in Western Washington this summer. On June 8 state and federal wildlife biologists captured an adult male gray wolf in eastern Skagit County. They took genetic samples from the wolf, and put a GPS tracking collar on it before releasing it. Wolves are listed as a federally protected species in Western Washington. They are not federally protected in Eastern Washington, though they are a state endangered species there. The state has set a goal in its conservation and management plan of maintaining 15 successful breeding pairs of wolves distributed around the state for at least three years before wolves can be removed from the state’s endangered-species list.